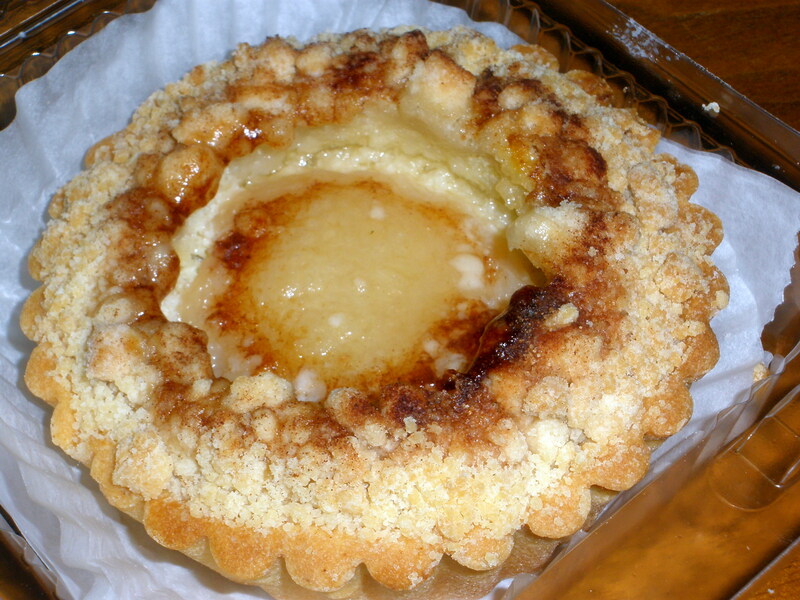 What a nice little pear almond crumble tart from Maple Street Patisserie! A buttery short crust holds a thin layer of almond paste beneath a caramelized-around-the-edges, velvety poached pear, all trimmed with a contrasting crunchy topping. It’s a good thing I don’t live closer to the Patisserie, or I would need Lipitor (or just a larger helping of self-control, perhaps). Have you tried Maple Street’s petits fours? Four multicolored layers, a whisper of raspberry, and a not-too-sweet icing decorated with minimalist geometric dots and stripes: they’re the soigne Continental cousin of the cupcakes currently blighting the dessert/bakery scene. Wow. Making this Starbucks blueberry scone seem really dry as I choke it down. So glad you decided to comment….so nice to hear from you! Starbucks scones are okay, if fresh, but too often the pastries are old & tired. Wish you were around to share the lovely pear tart. I can’t say a word about the service, as I rarely ever go inside the place. A kind soul delivers their delicious treats directly to me. Regarding the pastries being “just okay”, I can’t think of a better croissant in NOLA. Their croissants are head and shoulders above others in town, managing to capture the crisp outside and completely feathery, puffed interior of a good croissant. I had a croissant from Sucre at Lakeside last week that could have been plucked from a chain hotel continental breakfast. Perhaps it had been good at some point in the past, but it was soft, wan, and tired. Which is too bad, because Sucre’s croissants, direct from the oven, are quite good…but croissants don’t age well. Owners are dishonest, rude, and arrogant. Obviously, you haven’t travelled or gotten around NOLA much, MSP has horrible, tasteless, and stale, dry; and few day old baked products in their showcases!! !The owners are to involved in themselves and their personal relatationship to run a business effectively. This “Patisserie” is totally over-rated by a few senseless non-foodies!!! Wow–harsh words. Rather than sling words like “dishonest”, you’d make a more convincing case if you had a specific example. I have pastries twice weekly from Maple St; I haven’t encountered stale pastry, though it’s entirely possible that the quality declines as the day wears on (mine are always purchased in the early morning). I agree that the employees can be quirky at times. Happy holidays, and may you find a bakery you really like in 2012. To see other opinions of MSP (and photos of the baked goods), check out this post on Mr. Lake’s food messageboard.